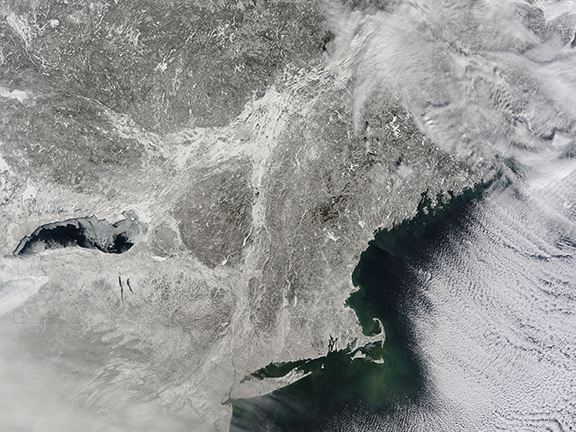 Yet another potent winter storm battered the northeastern United States on Feb. 14-15, 2015. The nor’easter brought 12 to 20 inches (30 to 50 centimeters) of snow across much of eastern New England, along with tropical storm force winds over 60 miles (100 kilometers) per hour. The latest snowfall pushed Boston to its highest monthly total on record—58 inches and counting—and its third highest yearly snow total. Aparna Parikh received the Susan Hansen Dissertation Proposal Award from the AAG Geographic Perspectives on Women specialty group. THON was a spectacular success again this year! Our EMS Student Council did an outstanding job toward helping THON again raise more than $13 million For the Kids. For the fifth year in a row, the College of EMS Benefiting THON is the top General Organization, raising $137,763.29 to smash last year’s previous EMS record. Geographic mobility data has become increasingly available with the wide use of location-aware devices and technologies, which provide unprecedented opportunities to capture and understand the dynamics of complex systems such as transportation, urban system, demography and ecology. However, it remains a challenging research problem to analyze, visualize and understand big mobility data due to the complexity of patterns, unknown structures in mobility, and the constrained map space. 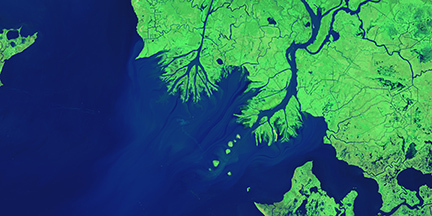 Every year, the United States Geospatial Intelligence Foundation honors a range of students interested in using geospatial science to address human security challenges. Open to graduating high school seniors, and undergraduate, graduate, and doctoral students, the USGIF chooses applicants based on an application process that evaluates academic and professional accomplishments in fields related to geospatial intelligence. The 2014 Scholarship Program winners included three Penn State students; undergraduate Everleigh Stokes and graduate students Seth LeMaster and Nouman Hussain. GIS Coalition is an organization that offers students majoring, minoring, or sharing an interest in GIS opportunities to develop supplementary knowledge and skills necessary to succeed in the professional GIS industry. “We want to enhance in-class teaching of GIS, and better prepare students for careers through speakers and out of class activities,” said president Blake Naito, currently a junior majoring in Geography, GIS option. The Penn State Student Sustainability Advisory Council is comprised of students who are committed to helping to advance Penn State’s strategic goals for sustainability. Appointed faculty and administrators from the Sustainability Institute, Finance and Business and Student Affairs are also members of the Council and they provide resources, support and assistance to help the SSAC explore ideas and implement recommendations. The Council provides consultation and advice on Penn State sustainability planning, programs, and initiatives. Last week’s dog was Fenway, companion to Rob and Becky Brooks. Hannah Ingram was the first to correctly identify him. Send a photo of your dog to geography@psu.edu for our mystery dog of the week! Chris Fowler was appointed to the Advisory Board for the Population Research Institute. Todd Bacastow was recognized by the Head of NGA for MOOC & CRADA at Esri Federal Conference, on February 10, 2015. 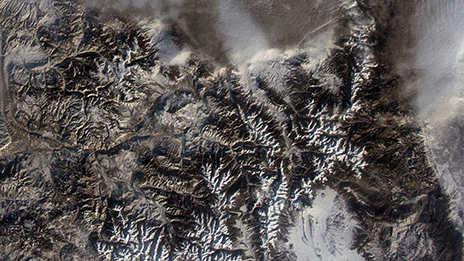 The terrestrial carbon cycle is an important driver of global climate. However, plant growth and the associated uptake of carbon from the atmosphere can be limited by the amount of nitrogen in soils. The constraint of nitrogen on carbon sequestration occurs on multiple spatial scales. Here, I explore the interactions between terrestrial carbon and nitrogen cycling at the individual tree, forest stand, and global scale. First, I will highlight research focused on quantifying how atmospheric nitrogen deposition has altered the growth and mortality of trees across the Northeastern U.S. Second, I will explore the sensitivity of forest carbon sequestration to nitrogen deposition. Finally, I will discuss how carbon-nitrogen interactions can be better represented in Earth System Models, a primary tool for predicting future climate. When the U.S. government decided to put boots on the ground in West Africa last fall to help staunch an emerging Ebola epidemic, agencies needed a lot of highly- trained medical and logistics personnel. But they also needed reliable maps — something Liberia didn’t have at the time. It does now, because local officials, overseas governments and the National Geospatial-Intelligence Agency agreed to work together in an open data framework. NGA led the effort to develop that geographic information in exquisite layers of detail in the span of just a few months, and posted the results on the open Web in real-time. Up to 75 percent of the seeds needed to produce the world’s diverse food crops are held by small farmers, researchers said following a review of international census data. Growers with farms of less than seven acres preserve diversity through “networks of seed and knowledge exchanges”, Karl Zimmerer, a Penn State University geography professor who led the research, told a conference of the American Association for the Advancement of Science on Friday. *We used data from the Census Bureau, which has two catch-all categories: “managers not elsewhere classified” and “salespersons not elsewhere classified.” Because those categories are broad and vague to the point of meaninglessness, we excluded them from our map. To enhance understanding of the process of climate change adaptation and to facilitate the planning and implementation of socially-just adaptation strategies, deeper consideration of the factors that impede adaptation is required. In response, scholars have increasingly identified barriers to adaptation in the literature. But, despite this progress, knowledge of barriers that hamper adaptation in developing countries remains limited, especially in relation to underlying causes of vulnerability and low adaptive capacity. To further improve understanding of barriers to adaptation and identify gaps in the state-of-the-art knowledge, we undertook a synthesis of empirical literature from sub-Saharan Africa focusing on vulnerable, natural resource-dependent communities and livelihoods. This paper takes stock of geographical contributions to the study of energy and energy futures. The paper is written in two parts. First, I trace the methodological and philosophical traditions that underpin geographical approaches to energy studies. I argue that while ‘energy geography’ is arguably a pragmatic shorthand with which to communicate to the broader energy studies community, geographical studies of energy have expanded in scope and theoretical plurality so that ‘energy geographies’ is a more appropriate label. Energy geographers are well positioned to contribute to scientific and policy debates surrounding energy due to their privileged position at the borderland between various philosophical and methodological traditions. 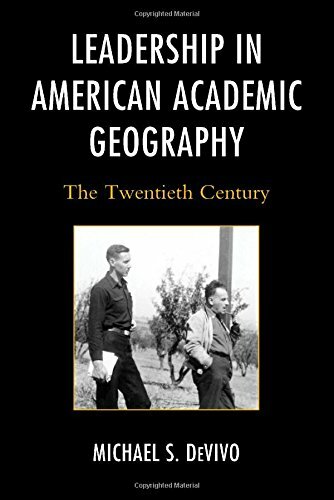 Second, I identify some of the problems, opportunities and uncertainties that contemporary energy geographers are helping to identify, understand, and resolve. Last week’s dog was Bonzer, companion to Andrew Carleton. Send your answer and/or a photo of your dog to geography@psu.edu for our mystery dog of the week! 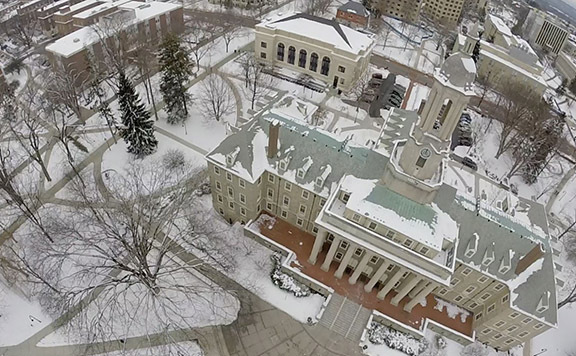 Photo taken by the Department of Geography and Institute for CyberScience’s “octocopter” UAV on January 27, 2015 shows Old Main on a snowy Penn State University Park Campus. Eun-Kyeong and colleagues published “Effects of Spatial Distribution on Change Detection in Animated Choropleth Maps,” in the Journal of the Korean Society of Surveying, Geodesy, Photogrammetry and Cartography. And in a recent visit to Tempe, Arizona, E-K gave an invited talk on “Exploring Bursts in Geographic Phenomena” at the GeoDa center, Arizona State University. Clio Andris and a colleague published an article “Good hard vs. bad hard” in the Chronicle of Higher Education. Jase Bernhardt and Andrew Carleton’s article “The impacts of long-lived jet contrail ‘outbreaks’ on surface station diurnal temperature range (DTR)”, has been accepted for publication in the International Journal of Climatology (a journal of the Royal Meteorological Society). Guido Cervone’s team won the NCAR Advanced Study Program and 2 visitor programs, so that most of the GEO lab (Guido, Laura, Elena, Gabriella and Anna —returning Italian visiting student) will spend between 2 and 3 months this summer doing research in renewable energy and hazards in Boulder, Colorado. Sterling Quinn passed his comps. 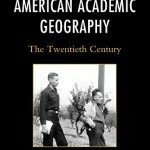 Jamie Shinn has accepted a position as an Assistant Professor in the Department of Geography at Texas A&M University. Lise Nelson is the lead author of an article titled “Latino immigrants and rural gentrification: Race, “illegality” and precarious labor regimes in rural U.S. amenity destinations,” which was recently accepted for publication in the Annals of the Association of American Geographers. Elena Sava’s paper on “Evaluating Lost person Behavior Models” was accepted into Transactions in GIS journal. Russ Hedberg passed his dissertation proposal defense. Cindy Brewer was profiled in WIRED magazine. Penn State’s Supporting Women In Geography (SWIG) calls for submissions to its annual student essay competition. Recognizing the role of gender, class, sexuality and race in the organization of our everyday lives, SWIG aims to promote and empower individuals within geography by offering a supportive network that sponsors opportunities to grow professionally, intellectually, and personally. This paper competition solicits perspectives on the following question: How do representations of scale or representations at certain scales give voice, or take it away? The online, searchable program includes a preliminary agenda of sessions, plenary speakers, and specialty group meetings. You can browse the program by presenter, keyword, title, or specialty group. You can also view sessions by day using the calendar of events. The 2015 College Town Film Festival opens with a film by one of our alums, John Fiege (M.S. ’99). On February 25 at 3:30 p.m. there will be a screening of his film “Above All Else” at the State Theater. “The film reveals the hidden story of how the Keystone XL pipeline battle in East Texas built a community of resistance to the climate crisis in America. Fiege has already produced several award winning films, “Chasing Paradise,” his first film, is screened in many of our classes. His new film debuted last fall to coincide with the climate change march in NYC. Last week’s dog was Jack, companion to Alan and Kristin Taylor. Rob Brooks was the first to correctly identify him. Send your answer and/or a photo of your dog to geography@psu.edu for our mystery dog of the week! Andrew Carleton, Adrienne Tucker, and Jase Bernhardt each gave talks at the recent annual meeting of the American Meteorological Society (AMS), held in Phoenix, Arizona. A new, environmental understanding of human development and behavior is emerging from the life sciences. Rather than treating the body as a bounded, relatively impermeable object that is largely determined by the genes, the new “epigenetic” view is that the body is unbounded and permeable. It is open to and shaped by myriad environment influences—and environment itself is considered both social and natural. Epigenetics specifically studies how environmental factors influence the expression of genes without changing the DNA sequence. Off the coast of Curacao, Penn State geosciences student Liz Andrews scuba dives 30 feet underwater, pulls out a tape measure and counts fish and algae along the coral reef. By comparing with past counts from the same spot, she can determine if the health of the reef is declining. Female students who want to make their mark in the film industry still face an uphill battle. So says a new study from the Center for the Study of Women in Television and Film at San Diego State University, which looked at the top 250 domestic grossing movies of 2014 and found that women occupied only 17% of leadership roles in the industry — the same percentage as they did in 1998. … Megan Ruffe (B.A. ’13), a 2013 Penn State alumnus who double majored in film production and geography, noticed during her cinematography and editing classes in college that there were few women in these particular areas. Instead, she said, the women often congregated in the production classes.